Who would have thought: Popeye the Sailor may have been right all along and spinach could give you bigger muscles. But it’s not spinach’s iron where it’s at, it’s the nitrate. If you remember who Popeye is, you also remember him gulping down a can of spinach and, boom, huge muscles instantly growing on his arms. Maybe you even remember your own parents giving you Popeye’s strength as an example when spinach appeared on your plate. But why assign that quality to spinach, of all things? Because an 1870s study had found vast amounts of iron in it and the creator of Popeye picked up on that. Much later, and probably to the relief of some children, it turned out that whoever wrote that paper probably had had a bad morning and placed a decimal in the wrong spot – spinach has only 1/10th of the iron previously believed. 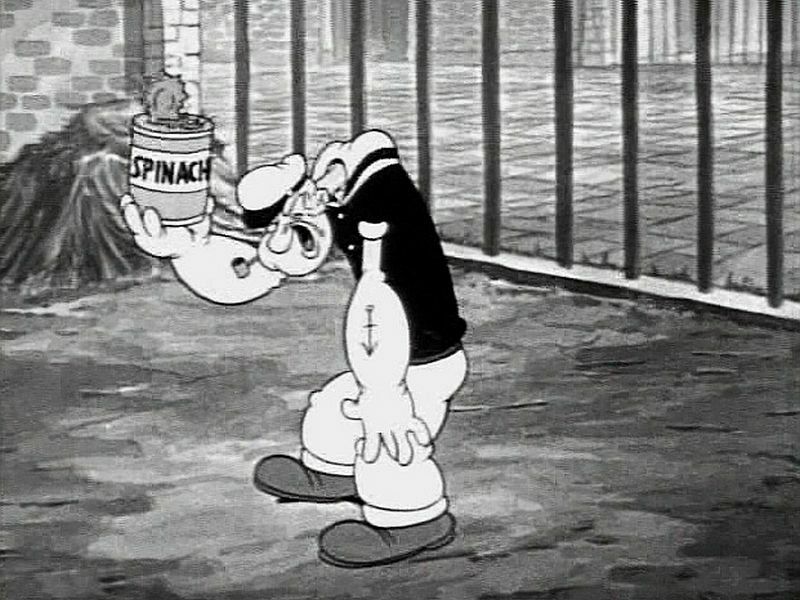 In 1929, when Popeye first appeared, for children the bitter taste of spinach was just another entry on their eek scale, where already cod liver oil resided. Back then that was another miracle food and parents administered it with the help of a spoon. That resulted in you getting a mouthful of fish oil, in all its gruesome fishy taste glory. Probably right after you had eaten your spinach. But enough of history, because Popeye may have been right, after all. A Swedish study tested what will happen when mice get water with ample amounts of nitrate added to it. Nitrates are groups of atoms within molecules, responsible for specific chemical reactions of the molecules. The result? The mice given the nitrate developed much stronger muscles than their compadres. The most interesting fact about this is that the nitrate almost exclusively targeted fast-twitch muscles, which are responsible for the size of muscles and do the bulking bit when you work out. Andrés Hernández, the study’s lead author assumes that this is due to the nitrate raising the amount of two proteins within muscles, which in turn is responsible for more calcium being in the fast-twitch fibers. This effect may allow them to last longer when stressed. And for those of you who have been keeping track about that spinach connection I so beautifully used to open this article: spinach contains a copious helping of nitrate. But, as always, caveat emptor, folks. Before you now raid the nearest spinach plantation keep in mind that what happens in mice doesn’t necessarily happen in the same way in humans. There has been a small study with human particpants at the same Swedish institute, where a similar effect was noticeable, but until researchers conduct the larger study with humans they are now planning, all this is preliminary. Nonetheless, we may want to keep an eye on what comes off of this. So far there are no fitness supplements containing nitrate, but brace yourself for them popeyeng up all over the place. Pictures courtesy of David Wagner and Wikimedia.